When you discuss about cancer illness, what do you have in mind? Cancer can come to you and your loved ones in various kinds –more than 100 diseases. A person will be diagnosed suffering a type of cancer if there are abnormal cells in a part of body that develop uncontrollable and attack other tissues. Due to the nature of cancer cells, cancer is always assumed as a life threatening disease. Unfortunately until today, the amount of people in the USA –women and men- who get cancer every year reaches more than one million; it’s definitely a large number! Those only in the USA; can you imagine how many people suffer this dangerous disease around the world? As I mentioned before, cancer can affect everyone, including people that close to you. I knew some women with breast cancer who could fully recover and some other who were not able to continue living. My high school teacher and an aunt died from breast cancer. A coworker got lymph cancer and I had three uncles affected with different cancer diseases; they all couldn’t survive. Happily, a sister in-law succeeded to recover as the breast cancer was noticed in the early stage. The mastectomy and several chemotherapy treatments can give back her health! If your loved one is suffering cancer, you’re surely hoping that there will be the most advanced drugs for cancer that can cure countless people. In fact, there are already many cancer research conducted by committed scientists; but most of medical studies face the lack of fund that needed to progress the research until reaching the next medical breakthrough. Don’t do anything, guys; to resolve this finance problem, you and others can participate in fund raising program and donate to cancer research through cureLauncher.com. 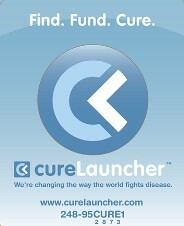 Thanks to cureLauncher.com, the medical funding community that has opened the way to unite scientists who require fund to run the clinical testing with people who need those cancer drugs and people who want to donate for cancer research. Today’s featured cancer research project that performed by Dr. Lee Roy Morgan is finding a new drug to treat metastatic breast cancer. The compiled fund will be used to produce more new drug that has been proved to offer recommending results in last small trial. For the next bigger clinical trial, the new drug must be made in larger amount. Think about many people that can be cured by those new drug; you can contribute to make it happens!